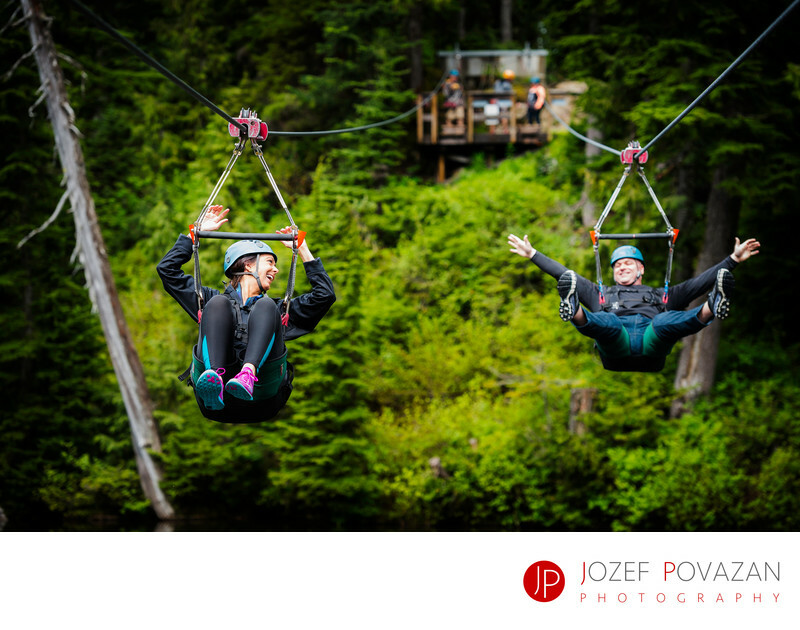 Grouse Mountain Zip line engagement fun cool pictures - Best Vancouver wedding photographer Jozef Povazan Photography studio. Grouse Mountain Zip line engagement fun cool pictures could be your next way of showing your love and sense for adrenalin. I had clients from California who made me to zip-line with them and create an amazing story from their Vancouver visit. Enjoying the thrill of speed and emotions. I had to even sign out form that if my camera gear breaks during zip-lining grouse Mountain zip-line would not be responsible for damages. And I flew with them and my 3 kilo camera strapped to my chest. What an amazing idea followed with one of the best adrenalin rushes I ever had. I would not recommend it to everyone. The impact on some of those lines was very impressive. Speeding down through the tree lines over 80 km/h and breaking with your body so the speed would not get even faster is priceless experience. You can be as serious as you think you are but this will crack you down to let it go. Absolutely unforgettable watch my clients laugh, shake, scream... You could feel the excitement in the air. If you love adventure and would be interested to have an engagement session where zip-line, bungee jumping or rock climbing is involved I would love to hear from you. My name is Jozef Povazan and I am untraditional wedding and portrait photographer from Vancouver. Love to work with people who love to be themselves and want to show it in their images. Get in touch and let's have fun to capture your story together. Location: Grouse Mountain, North Vancouver, BC.